The writing was on the wall for the Minnesota Twins and their need for a second basemen as soon as Brian Dozier was traded. Despite multiple seasons of power production, the Mississippi native had hit the skids. Logan Forsythe did a decent enough job filling in down the stretch, but this club was going to need more out of the position. Thanks to a perfect storm of less than ideal events, Jonathan Schoop found himself in Milwaukee and without a job. After being acquired from the Baltimore Orioles, Schoop went completely in the tank. Through his first 85 games last year he posted just a .720 OPS which was already a significant step back from his 2017 All-Star year. Across 46 games with the Brew Crew he posted just a .577 OPS and tallied a grand total of eight extra-base hits. For a team with postseason aspirations, he became unplayable and then was non-tendered this winter. The hope is that Milwaukee’s loss will be Minnesota’s gain. Obviously with this type of dip in production, we need to explore where things went wrong. Looking at the plate discipline and batted ball profile for Schoop, there are two glaring issues that jump out. First and foremost, the hard-hit rate dropped off the table. After a 36.1% mark in 2017, Schoop fell all the way down to 27.8% last year. The near 10% dip in quality contact is certainly going to show up in other areas, and that can help to paint a better picture. On the surface production faltered with inputs being measurably worse. Schoop’s .261 BABIP was nearly 100 points lower than the .330 mark he put up with the Orioles in 2017. Although the was a slight decline in HR/FB rate (roughly 2%), the greater factor here is roughly a 4% gain in ground ball rate that pulled from both fly balls and line drives. While hitting the ball more softly last season, he was also doing so with more grounders rather than fly balls. Common sense tells us that those instances are much more likely to be adequately fielded by defenders. Knowing what we do about his batted ball profile, it’s also worth looking into plate discipline and deciding what impact that had on the equation. It doesn’t take long to see that there’s a suboptimal shift here as well. After posting a career best swinging strike rate (13.8%) in 2017, that number rose to 15.1% last year. On top of swinging through more pitches, Jonathan also chased 6% more often, ballooning that number all the way up to 43.1%. Given his consistent contact percentages, these two numbers suggest he was being fooled more often at the dish and therefore suffering from offering at less than ideal moments. While not the drastic 50-60% pull hitter than Dozier was for the Twins, Schoop has a heavy pull-side profile as well. His career mark is 45.3% and he wears out the left side of the diamond. This is notable given the way in which he’s been attacked each of the past two seasons. As we can see in the images, his 2017 strike zone saw pitchers coming in on him plenty. The Curacao native was able to turn on those pitches and yank them to the part of the park he felt most comfortable aiming at. Last year though, pitchers seemed to make a concerted effort to stay away from his bat. Targeting the middle and outside half of the strike zone they were forcing Schoop to attempt to pull pitches best sent the opposite way. While betting lines aren’t any sort of indicator when it comes to future production, Schoop’s home run over/under from Bovada got me thinking. He’s set at 22.5 for 2018, and I think that’s indicative about how I feel toward his return to form. I don’t believe he’s the .293 hitter he was in 2017, but a healthy .800 OPS and 25 home runs appears plenty realistic with his profile. Miller Park didn’t help to solve his offensive woes, and while Target Field isn’t Camden Yards, the left field line should treat him well. 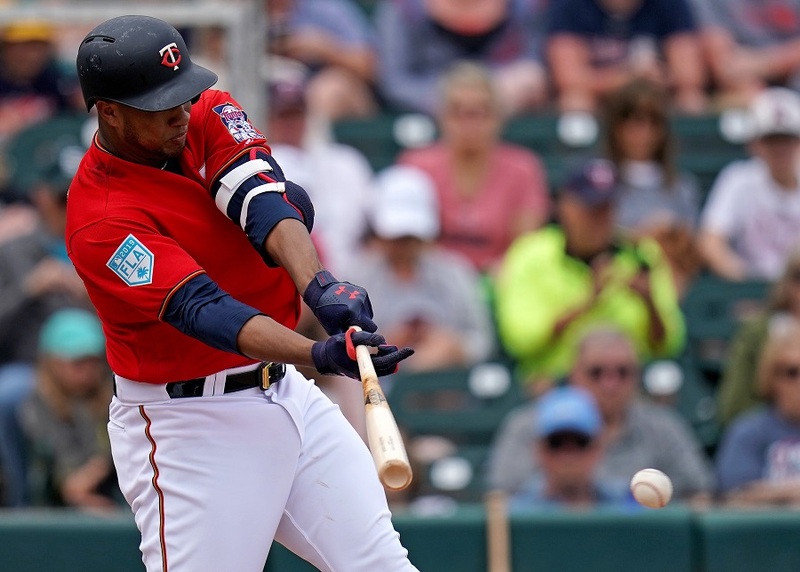 Settling back in to more of a picky approach at the plate should help the Twins second baseman land somewhere in the middle of his last two seasons. Replicating Brian Dozier’s 42 ding dong campaign of 2016 isn’t something that Rocco Baldelli will ever need from a second basemen. Minnesota’s new manager does need a more consistent level of production though, and betting on Schoop to bounce back could be a great way to achieve that. Homing in on pitches he can handle and/or developing a stronger ability to barrel balls the other way should be some key areas of focus. We’ll see soon enough if adjustments have been made this offseason, but there’s certainly a blueprint here for success. What I don't get about Schoop is how little he walks for a power hitter and how low his OBP always is. He only has a .34 spread between his BA and OBP career wise, .33 last year. I think of power hitters as having a bigger spread than that. For example, Nelson Cruz has a .66 career spread, .86 last year, twice or better than Schoop. Sano has a .92 career spread, with a .82 last year when he was only hitting .199. Look, I think Schoop's a defensive upgrade over Dozier and he probably will hit 20 plus Home Runs. I just don't see him as more than a good fielding power guy who shouldn't hit higher than 7th in a good batting order. With a career .294 OBP he makes a whole lot of outs and is a bit of a black hole in the lineup most days. Unless he can double the split between his BA and OBP he'll never be much more than that. Looks like a .260/.295/.440 guy in a good year. Not bad, but not exciting, and not a core guy you can build around even if he's a defensive wizard (which he's not). Now make him a .260/.340/.450 with above average defense at 2B and there's a core guy you can build around. Obviously battling injury most all last season, and trying to play through it and compensate, ruined his season. Whether or not he can duplicate/approach his 2017 season is open for debate. Healthy, and still young, he could easily do so. But he put up solid numbers in both 2015 and '16 as well. I'm pretty excited to see what he does in 2019 even though I agree he's really slotted as 6-7 hitter. He could be an excellent 1 year rental, giving way to another prospect a year from now...OR...worthy of a possible re-sign to buy more time for Lewis, Javier, etc, to be ready. Hope for the best, prepare for...normalization. Which is still above league average. I am prepared for our #7 hitter to be above league average. Comfortable with that, hope for more. Obviously battling injury most all last season, and trying to play through it and compensate, ruined his season. According to Schoop during a ST interview that wasn't the case. He could just be unwilling to admit it, but I'm not sure why that'd be. I saw Schoop a lot prior to last year since the Os are broadcast in my market and I think he will be more than just a pleasant surprise for the Twins. If he is close to where he was at his best for the Os he is an upgrade overall from Dozier. He could be that type of guy that doesn't make excuses?? I know that comes more from the old guard, but that could just be the way he is. Schoop put up good spring numbers but didn't seem to catch much buzz in the press or on this site. Maybe that's a good thing. Sneak up and surprise everyone. I hope he continues with the hot bat and puts up impressive numbers similar to 2017. This might end up being the best signing the team made all winter.